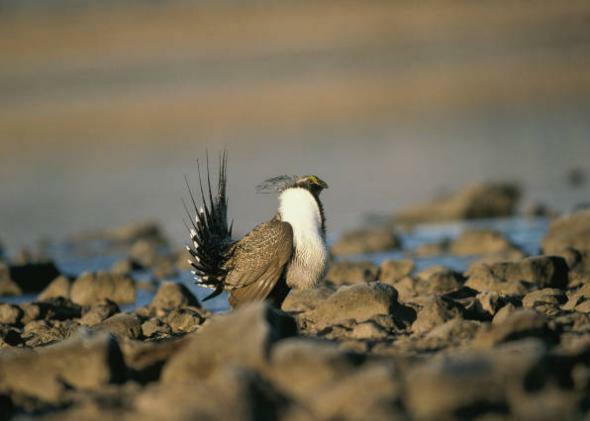 Greater sage-grouse lawsuits: Watch PBS Nature program on The Sagebrush Sea. A male greater sage-grouse struts his mating plumage at Clear Lake National Wildlife Refuge. One morning last March, I stood alone on a roadside in Utah and watched some chickens dance. I had come a long way to find them, and the birds did not disappoint. They spun and strutted and chased each other around in a field. They snapped loud ping-pong noises from inflated sacks on their necks and I laughed, partly because it was a funny sound, and partly because there on the roadside it was almost impossible to believe that these chickens were at the center of the largest and most contentious conservation effort of the century. The chickens were not domestic chickens, of course, but a related native species called the greater sage-grouse. The plump grouse stay out of sight for the majority of the year, keeping low in the sage to avoid being seen by birds of prey or coyotes, but their spring mating dances give the males a chance to show off their finery. They puff up the white feathers around their neck, spread their pointy tail feathers, and grow out stringy feathers from the back of their heads that float like a comb-over in the wind. Males gather on flattened patches of ground called leks, where they repeatedly make their wobbly air sac calls, hoping to woo nearby females. More than 16 million greater sage-grouse used to live in the sagebrush steppe that stretched from Washington and North Dakota down to New Mexico and Arizona. But just a few hundred years after the arrival of European settlers—who brought with them livestock and agriculture and invasive plants and, more recently, oil wells—sage-grouse populations have fallen dramatically to somewhere between 200,000 and 500,000 birds. “The Sagebrush Sea” reveals that The Big Empty is actually bursting with charismatic life, each species evolved in its own way to live in this hardscrabble country. The hip-high sage plants have managed to thrive in the high desert by stretching their roots to the water table more than 12 feet below. Prairie dogs and jackrabbits skitter through the brush to avoid the drifting shadows of golden eagles and prairie falcons. Tiny owls pop out of underground burrows. Pronghorn migrate between seasonal ranges; they’re the second-fastest animal on Earth, evolved to outrun American cheetahs (!) that lived in this habitat until 12,000 years ago. Two males chicken-dance on a lek in Utah. But it’s the sage-grouse that are at the center of the current controversy. As it became clear that their numbers were tumbling, conservationists petitioned the U.S. Fish and Wildlife Service to protect the birds under the Endangered Species Act. In 2010, Fish and Wildlife punted: It found that ESA listing was warranted, but it gave the birds a low priority, meaning they would wait years for protection. Lawsuits were filed, and Fish and Wildlife said it would come up with a better decision by September 2015. 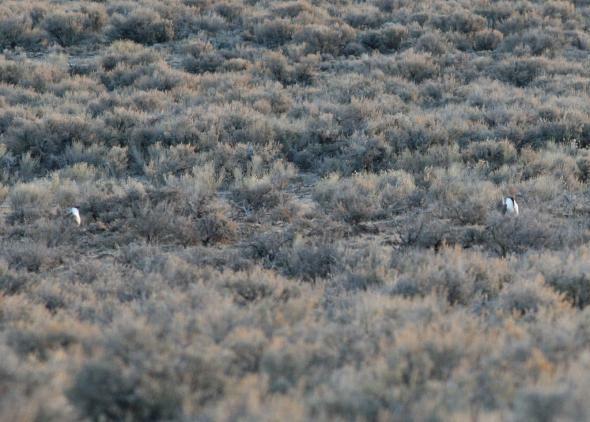 Western states with lots of sagebrush, especially those enjoying the benefits of a massive increase in oil and gas production, believe that an ESA listing for the greater sage-grouse would be a headache, making it harder to expand in sagebrush habitat. In December 2014, Republicans in Congress tried to protect the oil industry from the birds by pushing through a ban on using federal funds to issue an ESA listing. Meanwhile, in order to head off a decision from Fish and Wildlife, states are working with the Bureau of Land Management, which controls 60 percent of current greater sage-grouse range, to develop plans of their own to conserve the bird’s habitat without the restrictions of the ESA. The first of those plans are already coming out, including a grouse-centric federal wildfire strategy released Tuesday by the Department of the Interior, though it’s uncertain how they’ll coexist with Fish and Wildlife’s court-ordered ESA mandate. So while the male greater sage-grouse continue to visit their leks, American politicians keep up the dance on their own ancestral strutting grounds in Washington, D.C. The decisions made there in the next few months will shape the future of the greater sage-grouse and the American sage brush ecosystem. Watch “The Sagebrush Sea” this week, and maybe you’ll be inspired to take a seat next to me for these dancing chicken’s next recital.